The appeal of cities like New York and Chicago is their easy access to shopping, entertainment, schools, housing, parks and other amenities. This same idea of “New Urbanism” is popping up in many growing cities, bringing popularity to a spirit of community with less driving and more walking. And that’s where Ruth Steiner, professor of urban and regional planning and development, takes to the street. 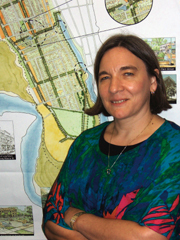 Steiner’s biggest challenges in urban planning are transportation systems that focus strictly on the automobile; she says mass-transit users, bicyclists and walkers are often considered secondary. Steiner is part of a team of UF researchers that develops tools to integrate all modes of transportation – cars, buses, bicycles and pedestrians – in order to form a more balanced transportation system. She has attracted more than $1 million in funded research on policies directed at facilitating alternative modes of transportation. “Dr. Steiner has been instrumental in developing computer-based tools that have allowed city and regional planners to better plan for alternative modes of transportation,” says Paul Zwick, associate professor and chair of the urban and regional planning department. With funding from the Florida Department of Transportation, Steiner and her team have worked with local governments throughout the state to implement the urban planning tools that are being tested in Gainesville, Orlando, Deland, Key West and St. Lucie County.